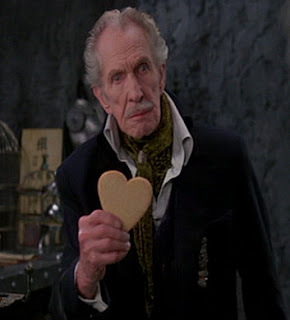 The Vault of Horror: The Vincent Price/Christopher Lee Birthday Throwdown! 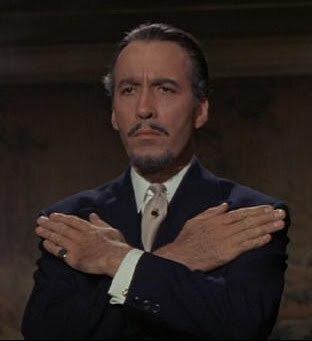 The Vincent Price/Christopher Lee Birthday Throwdown! Breaking with the somber remembrance of the birthday of Peter Cushing yesterday, tonight in the Vault, let's have a little fun celebrating the shared birthday of two other horror immortals, one still with us, one no longer. One was an effete American with a penchant for cooking who once rapped with Michael Jackson; the other, a swarthy Englishman who played Dracula, Frankenstein, the Mummy and a gay biker. 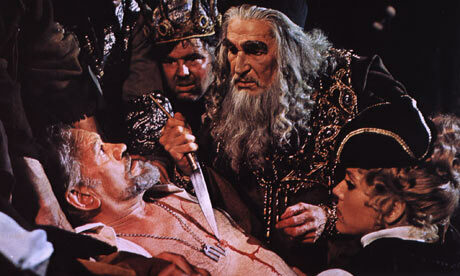 Tonight, it's all about Vincent Price vs. Christopher Lee. Yeah, I know. This one's not even fair. Chris Lee has played the Transylvanian Count more times than any actor alive or undead, a total of ten occasions from 1958's Horror of Dracula to 1976's Dracula and Son. 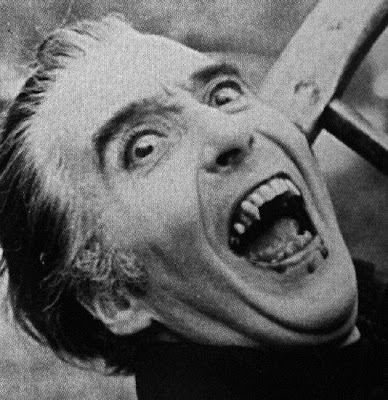 Price very famously turned down the role of Dracula a number of times, believing he could add nothing to it. He did, however, play Dracula's cousin once on an episode of F-Troop. Christopher Lee, in more recent years, has taken part in some big-budget blockbusters--like Star Wars: Attack of the Clones, in which he fought Yoda. Lee has not been one to poke much fun at himself, although he can be seen doing comedic turns in such films as Gremlins 2 and the critically acclaimed Police Academy: Mission to Moscow, in which he played Commandant Alexandrei Nikolaivich Rakov. 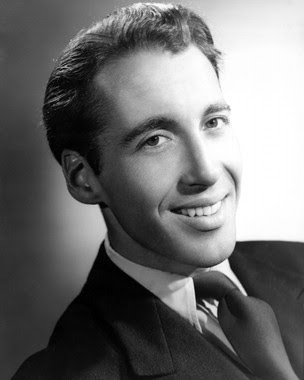 Price was far more enthusiastic about making fun of himself, as evidenced by his countless variety show appearances throughout the 1950s-1980s. 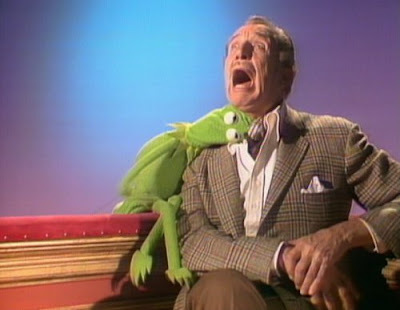 I'm particularly fond of his child-frightening appearance with Kermit the Frog. 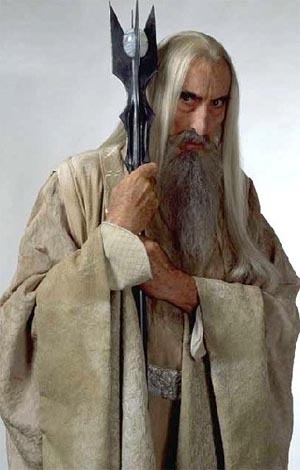 Lee rocked some Father Time-like facial hair as the wizard Saruman in another cherished geek franchise, The Lord of the Rings. And who could forget the curly Jew-beard, complete with fake hook nose, worn by Price taking on the part of The Merchant of Venice's Shylocke in Theatre of Blood? 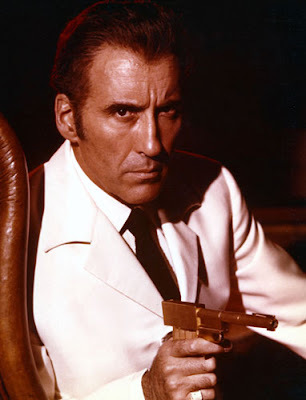 A career film heavy's ultimate goal might be playing a Bond villain, and Lee got to do so as Francisco Scaramanga in 1974's The Man with the Golden Gun. 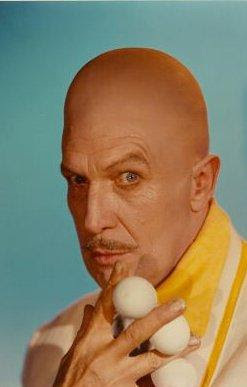 The closest Price came to playing a Bond villain was playing Egghead on the Batman TV show. 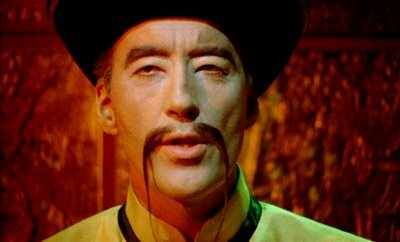 Lee played the very devious, very Oriental Dr. Fu Manchu on five different occasions. 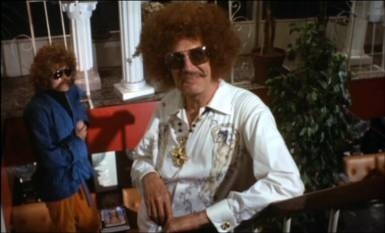 Aside from the aforementioned Shylocke thing, Price also took on the disguise of a stereotypically gay hairdresser for Theatre of Blood as well, complete with '70s white man fro! 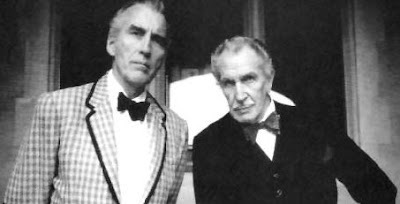 And finally, as we celebrate these two elder statesmen of horror who share a birthday, let's not forget one other horror icon who shares this birthday as well! 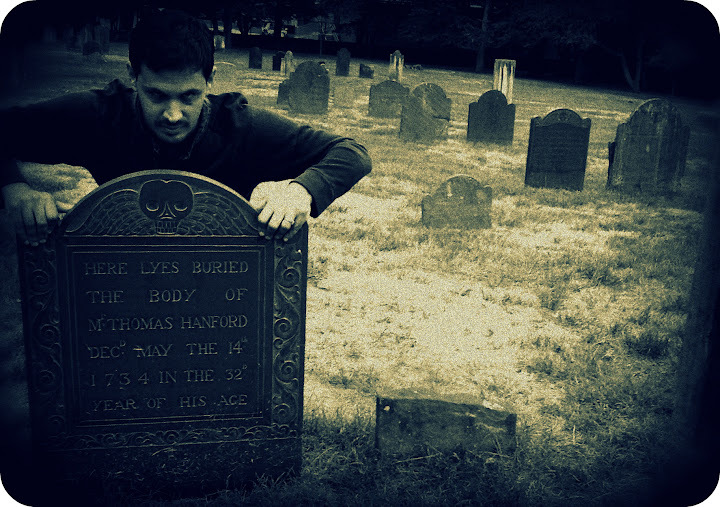 "Hey guys... Do you ever wonder about all the different ways of dying? For me... the worst way to die would be for a bunch of old men... to get around me... and start biting me, and eating me alive..."
* Special thanks to Kevin Maher for his immense help in putting this post together. Bravo, B-Sol. A fine tribute! Thanks Mike! Just got it in under the wire! Wow, a great and comprehensive breakdown! 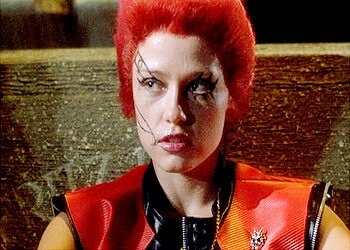 Bonus points for getting in Linnea Quigley too, her birthday gets eclipsed (perhaps rightly?) by these to icons. I had been wondering if they've been in films together, but couldn't find a way to cross-reference in IMDB. You've saved me the trouble here too. (Not that i've heard of any of those 4 films, but hey). House Of Long Shadows has Peter Cushing in it as well, I think it's the only movie that all three of them starred in together. I got to see Theater of Blood at Film Forum in a Gruesome Twosome double feature with Scream of Fear, and I have to say, it was one of the most joyful experiences of my life. 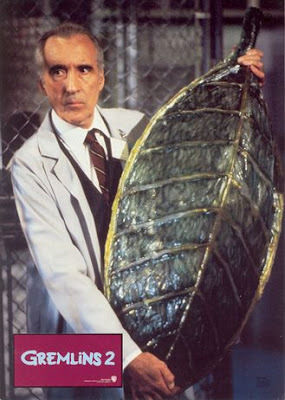 (And Scream of Fear has a tiny little bit of Christopher Lee in it too.) A lovely evening's pairing. 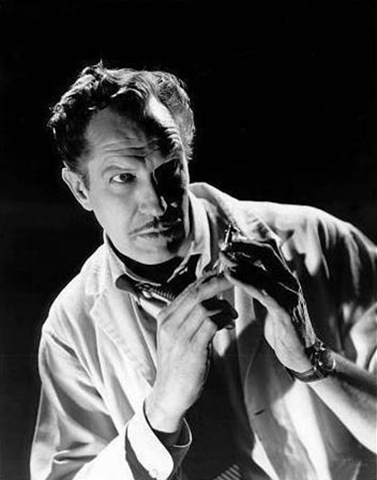 But really, you know Vincent Price is from Saint Louis originally, right? It makes me so proud to have lived there. Yeah, trioxin, I love me some Linnea, but she just had the bad luck of being born on the wrong day, I'm afraid. Ah Missy, these are the times I really miss the city. Film Forum is such a great place, used to go there many times in the college days. Joyful is definitely a perfect way to describe those movies--they make you feel alive, which is ironic, since so many people die in them.... My dad always tells me that when he was a kid, everyone thought Price was English because he was so well-spoken. I think that's kinda neat. I really miss the days old movies with Cushing, Lee and Price. And F-Troop was hilarious, forgot all about Price being in that episode! Happy brithday to two magnificent men. I had no idea VP was a Batman villain! I think I fell in love with him that much more. What a wonderful post! 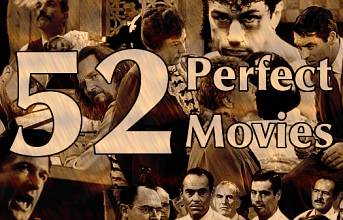 Highly informative and beautifully illustrated w/unfamiliar pictures and video. Yes Jeanette, indeed he was--and Egghead was my favorite villain from the TV show. 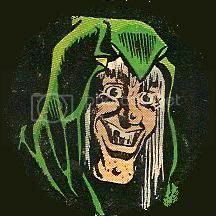 Always wished they would have brought him over into the comic book universe. Cindy, it's OK to prefer Price. I think most do, I know I do! Sorry, Mr. Lee. And thank you BCarter--it's my pleasure! 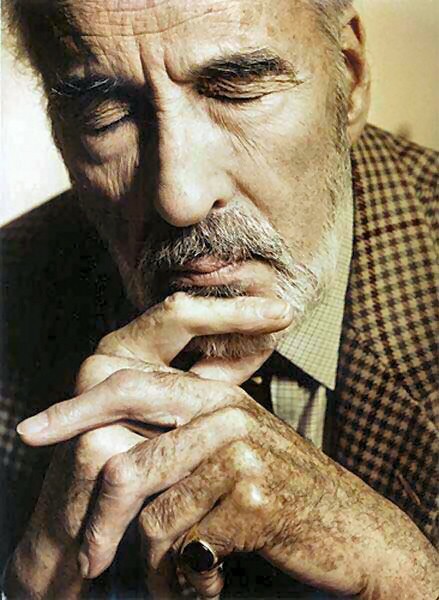 I love Christopher Lee and all his films plus he has a awesome singing voice, he will never be replaced in Dracula etc has he is the best. nobody will be so clever and talented as Christopher was.